What are some of the top mistakes employers make when it comes to OSHA recordkeeping? Let’s take a closer look at some of these common errors, and what steps you can take to avoid making the same missteps. Don’t make the mistake of believing an injury is not recordable as a work restriction if your injured employee is still doing useful work, even if that work is within their job description. Restricted work occurs when, as the result of a work-related injury or illness: You keep the employee from performing one or more of the routine functions of his or her job, or from working the full workday that he or she would otherwise have been scheduled to work; or A physician or other licensed health care professional recommends that the employee not perform one or more of the routine functions of his or her job, or not work the full workday that he or she would otherwise have been scheduled to work [emphasis added] (2, 6). Be sure you accurately report and record all injuries—each and every time. That means including as many specific details as possible in case you need to defend a certain incident or issue. With iReportSource, you have a guided process that was designed to help make sure all information is collected and recorded in an accurate and detailed way…no matter what worker is collecting that information for future use. A major part of this is making sure you have a way for all workers to record and/or report work-related injuries, illnesses, and incidents. If there’s no simple and accessible way to do so, it’s going to be much harder to make sure that information is consistently gathered in a detailed, comprehensive manner. One of the biggest errors employers can make is forgetting to track the days away from work once an employee has stopped reporting to work. You also don’t want to be in the dark when it comes to updates to an employees’ health that come from their physician (2). To fix this potential error, make sure you have a system that can track and monitor these types of subsequent events. With that kind of visibility, recordkeepers can consistently track them—and you can put that knowledge to use, too, so you can mitigate risks that have been causing those accidents in the first place. If requested by OSHA, would you be able to present your five-year history of logs with 4 hours? Many organizations, for a number of reasons, fail to maintain their OSHA 300 Log during the five-year storage period. That updating and maintenance includes newly discovered recordable injuries or illnesses. It also includes documenting changes that have occurred in the classification of previously recorded injuries and illnesses. If the description or outcome of a case changes, you must remove or line out the original entry and enter the new information (1, 3). The bottom line: make sure they are maintained, and make sure they are easily accessible so you can always provide those up-to-date copies to OSHA. 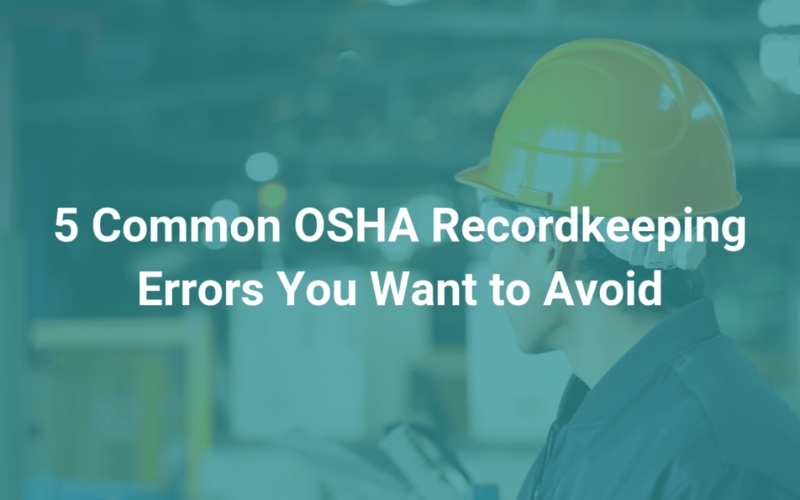 Yes, these are separate records, but information on workers’ comp records and OSHA records should at least coordinate and the information should be able to line up accordingly. That also means if OSHA were to ask to see your workers’ comp records, the information provided should be able to align with your OSHA log—or else, you should be ready to explain why it doesn’t (5). One significant obstacle with detailed, accurate and organized recordkeeping: not having a consistent, reliable way for workers to do it. iReportSource changes that, making it possible to track and manage workflow and accountability in real time. With everything from reporting employee injuries and auto accidents to performing job safety audits and inspections, iReport is your all-in-one safety solution. Request a demo to learn more today.